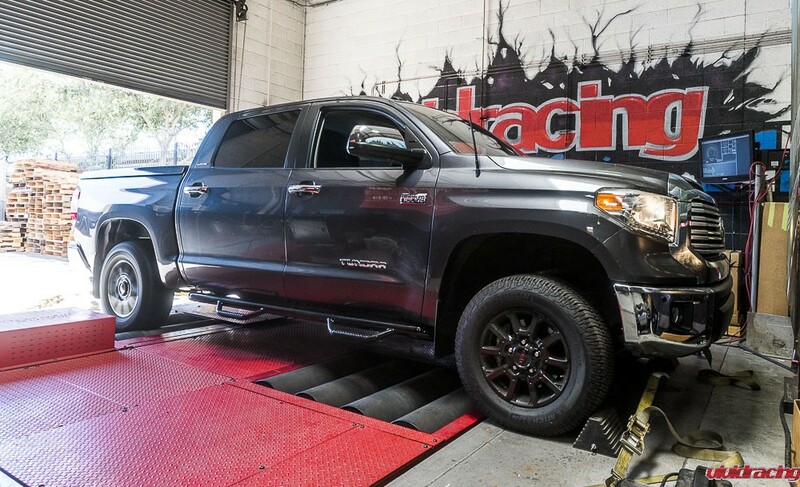 Toyota Tundra ECU tuning is a modification that can greatly improve your trucks 5.7L V8 performance. But what and how is an ECU flash done? First you need to know who is doing the ECU tuning. Vivid Racing’s VR Tuned division is your best choice for Tundra tuning. Vivid Racing has been in business since 2001 building high performance cars and featured in many publications, TV, and online networks. To prove our tuning power, Vivid Racing took our Porsche 997 Turbo to 206mph at the Texas Mile on a stock engine. In 2014, we launched VR Tuned to offer tuning for vehicles such as Porsche, BMW, Audi, Ferrari, Bentley, Mini, McLaren, and others. 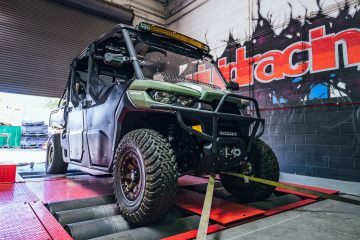 We continue to add platforms to our tuning solutions to even cover the popular UTVs like Polaris and CanAm. So why start tuning the Tundra? First is the demand. There is a limited amount of people that are doing the Toyota. 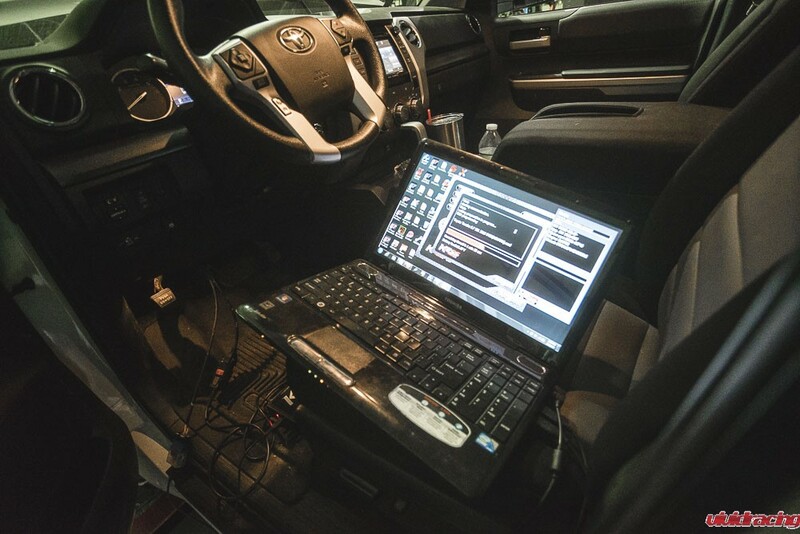 The protocols have been available for several years now to do these ECUs. 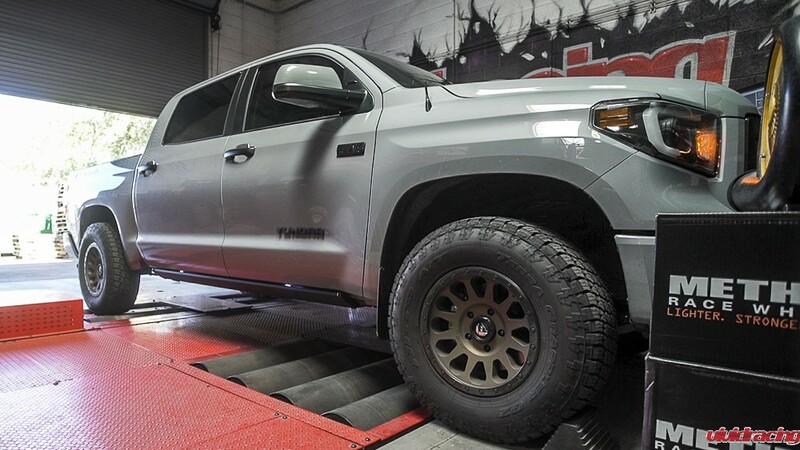 The Tundra seems like a challenging and fun platform to add to our line up. The second reason to do these trucks is we own a 2017 Toyota Tundra TRD Pro. With a drive to be the best in what ever we do, Vivid Racing is focused on making a permanent name for itself in performance truck parts and tuning. Not anyone can tune these kind of ECUs. 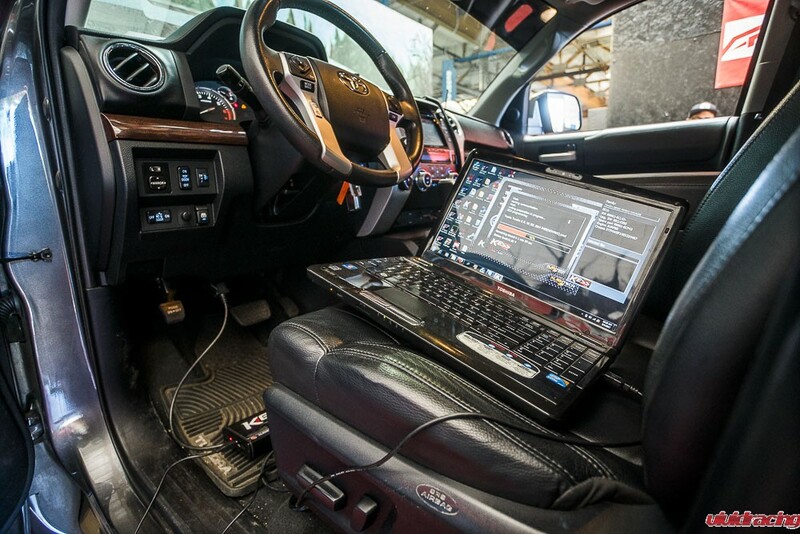 Tuning ECUs requires professional hardware and equipment to read and write via OBDII or on the bench. Besides the read and write tools, you need calibration software to edit the files. Several companies such as Dimsport, Frieling Racing, Alientech, CMD offer professional tools that range from $5000 to $15000 to allow you this capability. 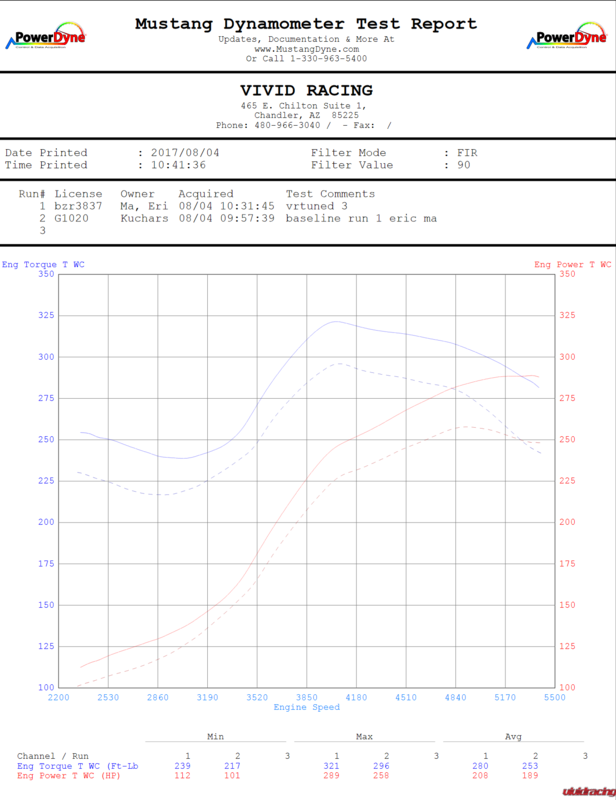 Tuning is typically developed on a handful of vehicles where you can verify software differences, air/fuel ratio, and of course the horsepower and torque. To verify this type of data, Vivid Racing has a Mustang AWD dynamometer. Having owned this dyno since 2005, we have run every type of vehicle you could imagine. What makes the Mustang dyno superior to others like the DynoJet is its similarity to real world numbers. The Mustang dyno is the most accurate and reliable dyno providing real-world numbers as if you were driving on the road. The eddy current, belt driven dyno will accommodate up to 1800hp vehicles and 175mph if you have the guts. Typically a RWD vehicle has a 15-20% drivetrain loss and a AWD vehicle a 25% drivetrain loss. For example, the Toyota Tundra makes 381 horsepower to the crank. With a 20% drivetrain loss, that is roughly 304 rear wheel horsepower. Getting right into the tuning of the Tundra, we focused on the latest 5.7L V8 engine using the Denso ECU. Based on feedback and general tuning concepts, we focus on improving the vehicles horsepower, torque, e-throttle response, shifting points, and raising the speed limiter. Our first goal in the tuning R&D was to get a baseline of the Tundra. Putting out a “Get a FREE Tune” post on Facebook, several candidates came to our Gilbert, AZ facility. 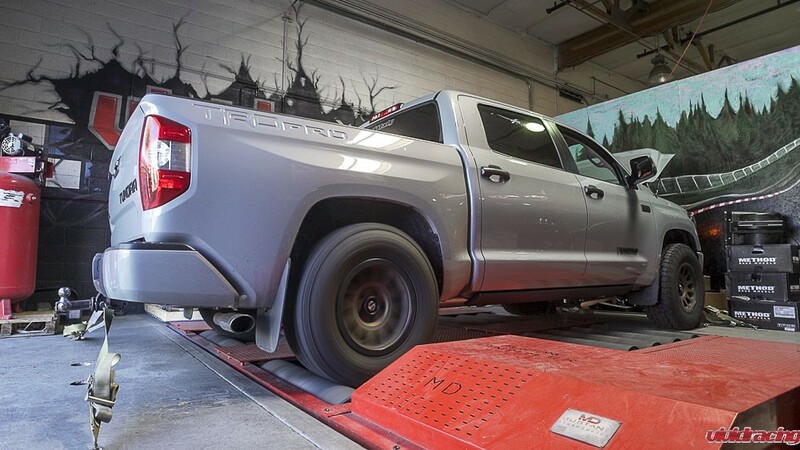 When we set up a Tundra on our Mustang Dyno, we first need to calibrate based on RPM. Typically we calibrate in 3rd gear at 3000 rpm to setup a vehicle. Higher horsepower cars we might calibrate to 4th gear. We always set our parasitic multiplier at 1.00. You could set your multiplier to 2.00 to read high like a DynoJet, but what is more important is the delta (gains). Once we calibrate a vehicle, we can then run our horsepower tests. We set our start test to be at 2200 rpm and our stop test to be a 5500 rpm. When you put the Tundra in manual mode, it is not a true manual transmission. So when you run the dyno tests, you have to roll into the throttle. If you punch the throttle 100% before 3500-3800 rpm, the truck will downshift. This is why you see our dyno sheets roll into the power. Having done roughly 50 pulls on different trucks, we are able to keep this somewhat consistent. Tundra ECU Tuning Test 1 Our first truck tested was this 2014 Toyota Tundra with a BAMuffler. All tests were done on 91 octane. With an ambient air temp of just over 100F with 30-40% humidity, these conditions are not optimal to “show” gains. Most dyno tests are done using 93 octane in cooler temperatures. We never recommend 87 octane if you are looking for performance. It is best to run 91+ octane or E85 for Flex Fuel trucks. It is important to keep fans on the vehicles radiator and intake to help simulate driving airflow. Dyno tests are great to show gains, but we can’t show shift improvements or overall driving improvement from street driving. Another note is that naturally aspirated vehicles always have an adaption period where the ECU learns and improves. When we test vehicles, we do 3 of each run. 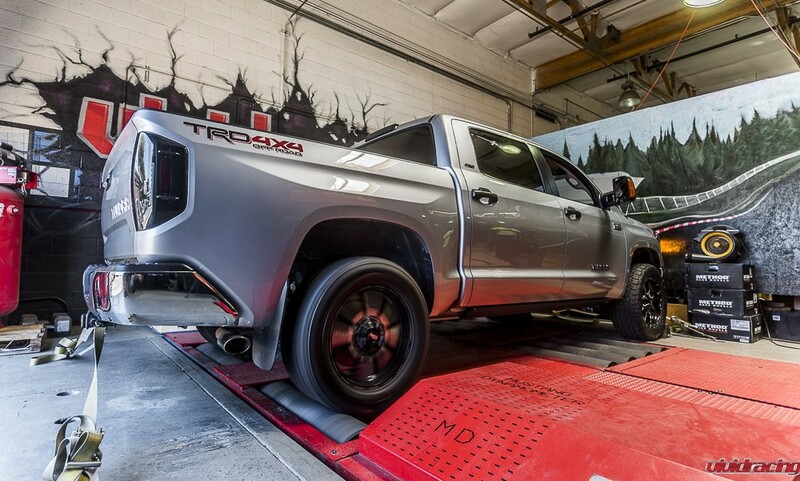 Our best baseline dyno test yielded 306 rear wheel horsepower and 283 ft/lbs of torque. This 306rwhp puts us spot on for the drivetrain loss from 381 bhp. The VR Tuned performance ECU flash is loaded to the vehicle via the OBDII port. For those not at our Arizona facility, you can do this remotely with the Dimsport MyGenius tool. Flashing time is pretty quick taking about 5-8 minutes to write the 992kb file. With the VR Tuned, you always get an original file to flash back to if need be. 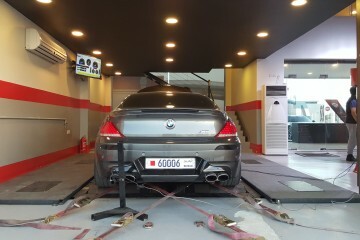 Before any adaptation or street driving, we run the vehicle again with the new tuned file. 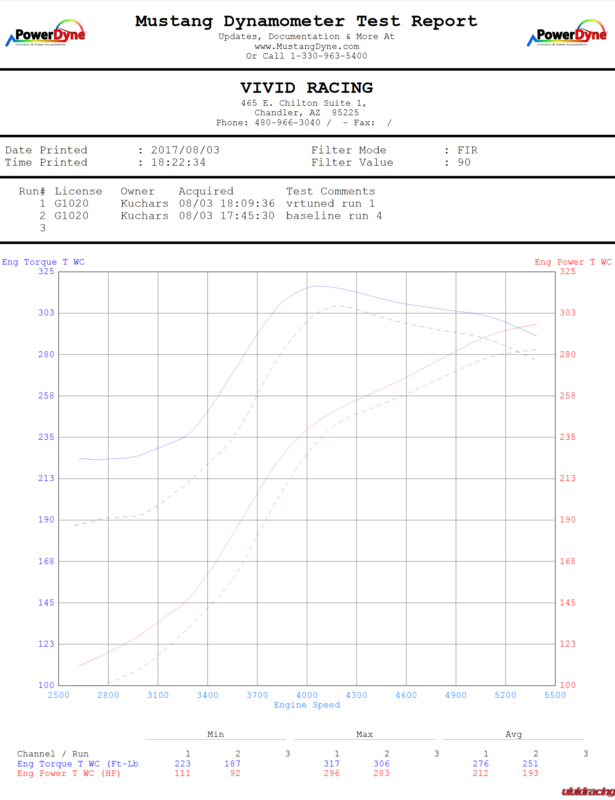 Our best tuned dyno run was 317 rwhp and 296 ft/lbs of torque. You can see how we have to roll into the throttle and then it is hammered down about 3500 rpm. These gains show us 11 rwhp and 13 ft/lbs of torque. This is a equivalent to a 15 bhp gain or a 3% gain in horsepower. 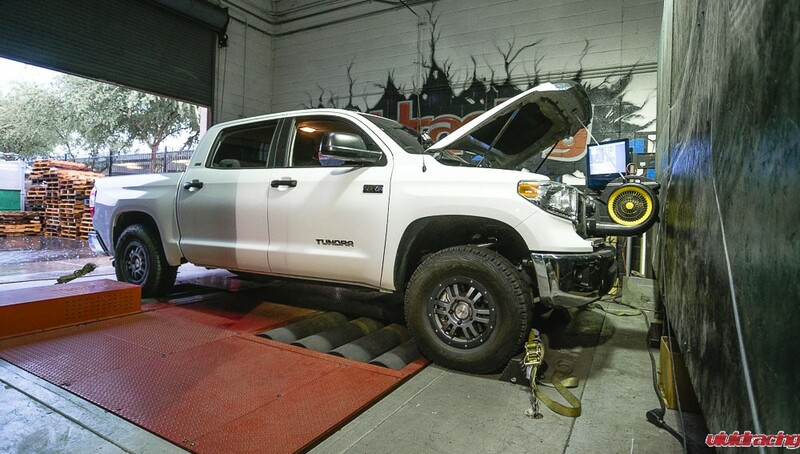 Tundra ECU Tuning Test 2 This next truck to test was also a 2014 Toyota Tundra with the 5.7L V8. It was also filled with 91 octane and tested in similar environmental conditions of 100F. This particular truck was already equipped with a cold air intake and dual exhaust. These tests were run back to back like others. We will point out a naming mistake on the dyno, but this is the true before and after of this truck. Like all tests, we have to roll into the throttle so the truck will not downshift. 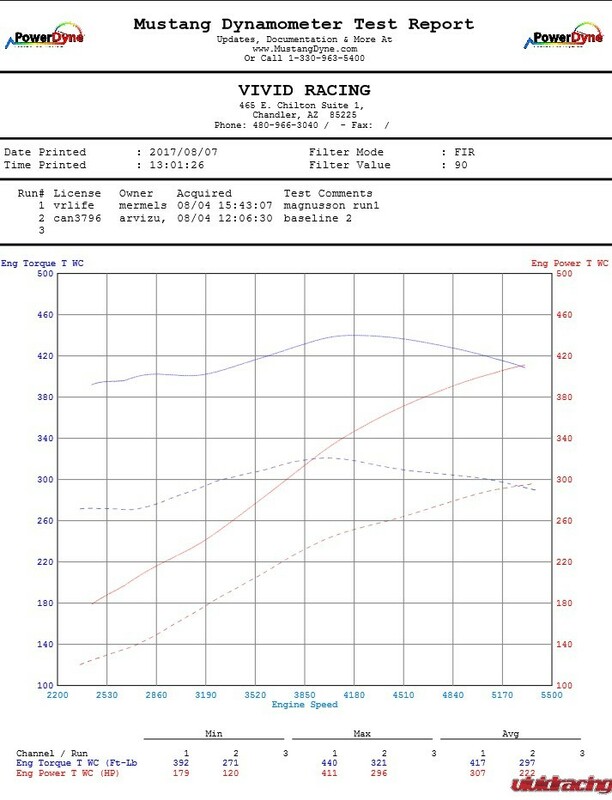 The gas is full throttle at about 3500 rpm as you can see on the dyno below. Now the baseline of this truck was 258 rwhp with 296 ft/lbs of torque. Why is this dyno 20 horsepower less than the previous? This could be due to cooling. Test 1 we had better fans on the front of the truck. Since we chose to calibrate this truck instead of using the previous test calibration, this could be the cause of the variance. The peak number is not as important as the gains, so we will focus there. After loading the VR Tuned flash via the OBDII port, we completed 3 test runs. The best tuned run shows 289 rwhp with 321 ft/lbs of torque. This is showing a large 31 rwhp and 25 ft/lbs of torque gain. If you look at the baseline test, the horsepower falls off at 4840 to 5500 rpm. If the cooling was not a issue, you can see this line would have carried on in the same trajectory to about 275 rwhp giving us a more common gain of 14 rwhp gain. Fun Comparison If you are looking to really gain some horsepower, than the Magnuson Supercharger Kit is where it is at. There is an obvious cost difference but the supercharger kit adds an incredible 100 wheel horsepower and torque over stock. The kit comes complete with everything you need including Bully Dog tuning. For those that are worried about warranty, Magnuson includes a 3 year, 36,000 mile warranty or you can purchase an upgraded warranty for $475 covering 5 yr/60K. Magnuson produced the earlier TRD kit which is no longer available. With supreme engineering and 1000s of R&D hours with Bully Dog, the complete kit is an excellent upgrade. With a retail price of around $6900 for the kit, Vivid Racing does offer financing with Affirm.com for those that want to go big! Read more about our Supercharger Kit here. Can-Am Defender HD10 ECU Flashing – Everything You Need to Know!